I guess its been a while since my last post. 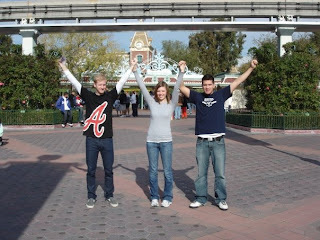 Disneyland was almost 2 months ago... haha oops. Cisco loved it which proves that you don't have to have childhood memories for Disneyland to be magical. We had a blast and it was a great break after a crazy semester. 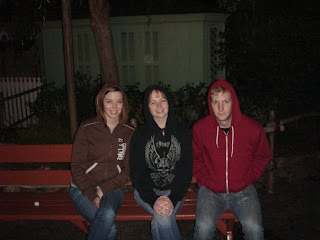 I was waiting to get pictures from Disneyland but i never did so these are not the best quality. The night we got to California we went to Camille's apartment and decided to go out to dinner. Camille gave us a real cultural experience! We went to a restaurant called Chicken and Waffles... and that is exactly what it is! My order was a fried chicken wing and a large waffle. It was delicious and so random! Of course eating fried chicken made me feel extremely sick afterwords but it was worth it. Cisco and Casey were in their own heaven and were convinced they needed to move to California just to be able to go here more often! You can see in the picture my chicken, and my waffle. 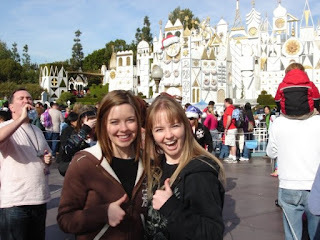 This is us on the first day in front of Disneyland. We were excited to go in. My first time on Its a Small World! It was the Christmas version so it wasn't quite as annoying as it could have been. I'm not really sure why the line was so long though. The real Santa Clause sat behind us. That was funny. Bugs Life!! One of Cisco's favorite. 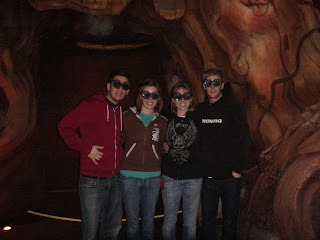 Close up of our special "bug vision goggles"
On our second day in Disneyland was a little cold! Nicole and Casey went to get our sweatshirts from the car and we realized Cisco forgot his sweatshirt at the hotel. oops. After deciding it was ridiculous to spend $50 on a Disney sweatshirt he would never wear again we tried to be sneaky and tell lost and found we lost a sweatshirt. Cisco and I tried, Nicole tried, and Casey tried. We all asked for different descriptions of sweatshirts but had no luck. Me and Nicole had both doubled our shirt layers so we each gave him one layer and he looked great in his new "muscle shirts". They kept him warm though and you couldn't really tell he was wearing women's shirts under his shirt. Right? 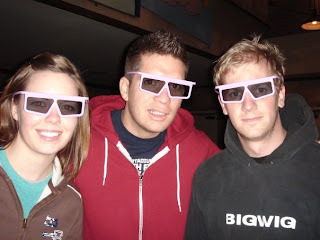 We were waiting for Thunder Mountain to open again and it never did. We were exhausted so we just left. 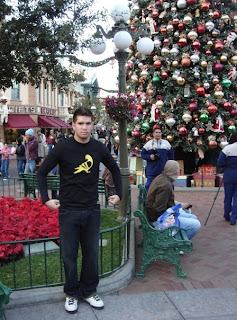 Thats it for the Disneyland post. Sorry about the lack of details!